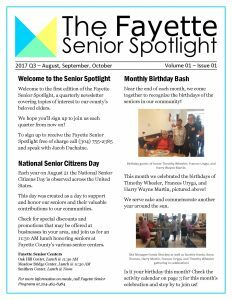 The Fayette Senior Spotlight is a quarterly newsletter for and about the seniors of Fayette County. ©1975-2019 Putnam County Aging Program, All rights reserved. Putnam County Aging Program is a proud member of Meals on Wheels.